Honey, as well as being full of skin loving vitamins and minerals, is also a natural emollient which keeps moisture locked in. Oatmeal has been used for centuries to soothe all manner of skin irritations. 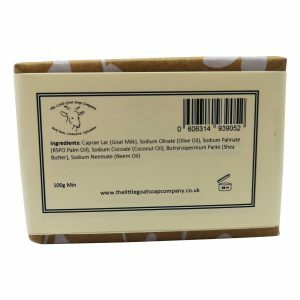 Combined with Raw Goats Milk, this really is a Soap your skin will love you for. Suitable for all skin types. 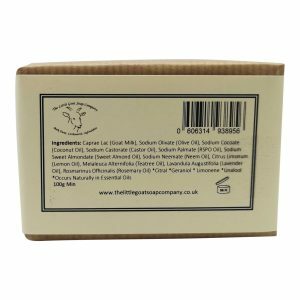 Especially recommended for eczema, acne, dry or irritated skin. Caprae Lac (Goat Milk) Sodium Olivate (Olive Oil), Sodium Palmate (RSPO Palm Oil), Sodium Cocoate (Coconut Oil), Butryrospermum Parkii (Shea Butter), Avena Ativa (Oat) Kernel Meal, Tocopherol (Vitamin E), Honey. I brought this soap at a stall, and I have used it everyday! it does exactly what it says, it leaves my skin feeling clean, refreshed and not dry at all! I am definitely re-purchasing this product and would recommend it to everyone! I have been using these soaps for quite some time as my hands get very dry. They are extremely good, and make such a difference to your skin especially in the winter when the dryness can be quite severe. I really love the smell of this Honey & Oats; it is one of my favourites. So glad I found The Little Goat Soap Company. I purchased this soap on one of your stalls. My boyfriend has quite bad eczema. He used one bar for a white and when it ran out his eczema cans back so bad. He then found the other bar of soap and it’s pretty much cleared up again. Defo re purchasing!